Calling all tech addicts! Save yourself from the tangled mess of device overload with this One Stop Desktop Desktop Charging Station, Valet and Desktop Organizer by eliminating workspace clutter and keeping your electronics charged and ready to go! This unique Desktop Organizer has charging spots and cord control for laptops, tablets, smart phones and more, as well as storage compartments for mails, magazines, files and desk supplies. Clear your desk so that the real work can happen! A 4-Port USB Power Strip is included. 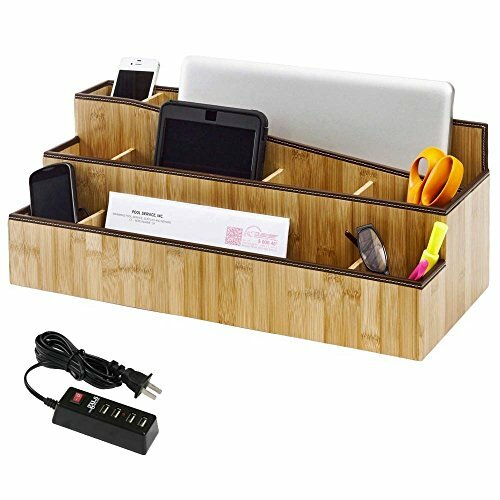 THE BEST DESIGNED COMPLETE DESKTOP/WORKSPACE ORGANIZER -- Our Bamboo workstation is built out to maximize storage to minimize clutter. There are 9 uniquely designed compartments. Three are devoted for small electronics and smart phones, 1 is built for either laptop (all the way up to 17") or acts as a file folder if you prefer. The three middle row compartments are great for Readers and small office items, and 2 front compartments are great for memo pads and mail. EASY TO USE CHARGING STATION FEATURES -- The workstation /home office is a great place to charge all your gear, so we designed our Workspace organizer to keep all your gear fully charged AND organized. 4 compartements (3 for phones and small electonrics) and 1 laptop sized compartment all have quick access doors to the main charging bay located in the back where they can plug into USB power hub (included). DIMENSIONS -- 20.8" L x 9" W x 8" H, universal charging bays are compatible for all smartphones and readers, and the up to a 17" laptop.